Nicos Savvas Pantelides died at Johns Hopkins Hospital while undergoing treatment for Non-Hodgkins Lymphoma. Nick, famous in Annapolis for his devotion to family, Church and the U.S. Naval Academy, will be missed dearly. In addition to his many achievements as a sailor, admissions officer, and lacrosse coach, Nick was a true patriot and god-fearing family man. Born in Nicosia, Cyprus, Nick was one of six children and raised in Annapolis by his Greek parents who owned the Royal Restaurant on West St. He graduated from Annapolis H.S. in 1966. He enlisted in the Naval reserves and attended Bullis Prep before entering the Naval Academy. While at the Naval Academy Nick played on the 1970 National Lacrosse Championship team, served as the “Hop Committee Chairman” for Mrs. Emmy Marshall where he organized the selection of USNA’s first homecoming Queen & Parade, served as boxing instructor and head of the swimming sub squad. After graduating in 1972, Nick’s first assignment was on the USS Saratoga (CV-60) in support of the Vietnam War. He completed two combat missions and received the National Defense Service Medal, Navy Unit Battle Commendation, Vietnam Service Medal, & Vietnam Campaign medal. His next assignment was at the Naval Academy, where he worked on several improvements to the Academy to include the restoration and renovation of the “Athletic Hall of Fame”. However, Nick’s most significant accomplishment during this assignment was dating and marrying the love of his life, Dolly Tsatsios. 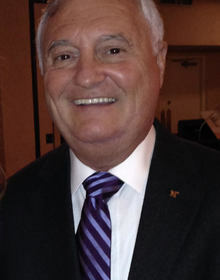 Nick remained at the Naval Academy serving as Admissions Officer from 1981 to 2004. During his tenure, he was one of the original architects of the existing admissions systems and he designed and introduced scan forms not only for the Naval Academy, but also for Army and Air Force Academies. He felt strongly that the best Naval Academy candidates were gritty and over-achieving young men and women, but it also helped if they were Greek. He served as the Secretary on the Admissions Board and was also responsible for selecting Vice Presidential nominees for the Naval Academy. In total Nick served 36 years and 17 days, including his military and federal service. In addition to his dedication to USNA, Nick was a remarkable husband and father. His 42 years of marriage with Dolly exemplified to all who knew them what a wonderful couple they were. Nick and Dolly were soulmates, never leaving each other’s side. They lived in Annapolis and raised their four children – Anastasia, Christa, Sophia, and Savvas. For 25 years, they opened their doors as a Sponsor Family to countless midshipmen. Nick is survived by wife, Dolly and four children, Anastasia Pantelides, Christa Clagett and her husband, Steve, Sophia Deane and her husband, Jake, and Savvas Nicos Pantelides. Friends are invited to celebrate Nick’s life with his family on Wednesday, December 12 from 2 to 4 and 6 to 8 pm at the George P. Kalas Funeral Home, 2973 Solomons Island Rd., Edgewater, MD. Nick’s funeral service will be held on Thursday, December 13 at 10:30 am at Ss. Constantine and Helen Greek Orthodox Church, 2747 Riva Rd., Annapolis, MD 21401. Interment at St. Demetrios Cemetery. In lieu of flowers, donations may be made to Ss. Constantine and Helen Greek Orthodox Church. I'm truly saddended by Nick's passing. He was a great guy, valued teammate, and cultural cousin given his Greek ancestry. After more than 50 years, I still recall specific acts of kindness by Nick that demonstrated his character, friendship, and empathetic nature. My sincere condolences to his family and friends. He will be missed. Nicky was a great guy. He'll be missed.